Soak agar agar stick in a med. bowl with 2 c. warm water 30 minutes. Transfer agar agar and water to a lg. saucepan. Add 4 c. water. Bring to a boil over med. heat and cook until agar agar is completely dissolved. Peel mango and chop into sm. pieces. Remove saucepan from heat and add sugar, milk and chopped mango. Stir until sugar is totally dissolved. Pour into a 12x8 cake pan. Let stand until cool. Refrigerate until pudding is firm, about 15 min.Cut into diamond shapes. Garnish with marachino cherries. Serve chilled. Makes 6-8 servings. 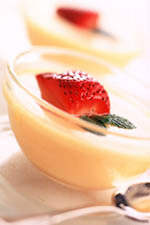 VARIATION: Mandarin Orange Pudding: Substitute 1 segmented peeled mandarin orange for the mango pieces.